The most crucial part of getting an auto title loan is your interest rate. How much money you receive, and the value of your car, ultimately mean nothing in the end. It’s the interest rate that dictates how much money you’ll be paying as time goes on, and what determines how quick you’re able to repay it. Here, Phoenix Title Loans, LLC will discuss how you can lower your interest rate, and what incentives we have for low-interest rate auto title loans. We’ll always offer you the max auto title loan value for your vehicle based on your application, but does that mean you need to take the full amount? No! The best thing you can do for yourself is to take less than the amount we offer as, one; you most likely don’t need the entire amount and, two, not borrowing the full value makes your interest payments lower. Also, with less borrowed, Phoenix Title Loans, LLC can offer you a better interest rate due to reduced risk. The best way to get a reduced interest rate is to refinance your current auto title loan through us. Plus, with the coupon you can find here, you can even get $50 BACK for re-financing! Our interest rates are what brings customers to our doors, so if you come and re-finance, we’ll give you an even better, lower interest rate on your auto title loan. With ten convenient valley locations in Phoenix, Scottsdale, Avondale, Mesa, Tempe, Chandler and Casa Grande, we’re here to serve you with lower interest rates. Get 60% APR Interest Rates! A Win for Residents of The Valley! Phoenix Title Loans, LLC is the leading auto title loan lender in Phoenix, Scottsdale, Avondale, Mesa, Tempe, Chandler, and Casa Grande, for many reasons, but mainly because we’re here to help our customers! Unlike all the other auto title loan lenders, and Phoenix Title Loans, Phoenix Title Loans, LLC cares about helping its customers. As such, if your principal balance on your loan is lower than half the value of your vehicle, we will reduce your interest rate. That’s as much as 70% lower than other lenders, and we’re more than happy to do it. Even if you borrow an amount close to the value of your car, we can get you up to 60% APR. As soon as you cross that 50% auto title loan principal balance value, you ask, and you qualify, we will gladly lower your interest rate to help make the loan much more manageable. Any other perks to Phoenix Title Loans that makes you stand out? Absolutely! While our competition will offer 30 days no payment on their loans, we’ll up the ante and come at them with 60 days no payment! That’s right, two whole months to get you back on your feet before you even need to make the first payment. We also have the benefit of accepting almost ANY vehicle as long as the title is free and clear. If it’s not yet, contact us and we can assist as best possible. And even IF you chose to go somewhere ELSE for your auto title loan, Phoenix Title Loans can still help you out! We buy out title loans and even refinance title loans in case, after working with a competitor, you feel it too much for handling. And at our location in Van Buren, our Boat Title Loans customers have the benefit of us storing their boats with us while they pay. Free up the time to get your loan paid and space around the home for whatever purpose in mind. Are there other Title Loan companies willing to provide these great services? Other than us, very few. Phoenix Title Loans, LLC, is unique to Phoenix, Scottsdale, Mesa, Chandler, and Tempe, in the sense that we can offer low interest rates in town. As discussed above, we make you a cash offer. 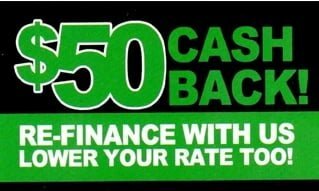 If you decide to take less than half of the cash offer we’ve given you, then we can then lower your interest rate to 60% APR! There’s nowhere else in town that will come close to that rate. One of the best features of Phoenix Title Loans is our numerous locations across the Valley of the Sun. Instead of desperately searching for an auto title loan Phoenix store, look to us! We have eleven locations spread throughout the Valley, in Phoenix, Scottsdale, Chandler, Avondale, Mesa, Tempe, Casa Grande and so on. We even provided the kinds of auto title loans Casa Grande locals would want! And customers keep coming back to us as the auto title lender choice when they need a financial problem solved!